Gary shared his local knowledge, his sense of humour, and his understanding of wine in the region with us.His choice of wineries and restaurant were perfect. It was a pleasure to spend the day with him. We would definitely book another tour with Gary and Bliss Tours the next time we are in Napa. We organised a private tour with Damon, just before Christmas. We've been to Napa a few times before, and wanted to explore some smaller wineries that we'd never heard of. Damon customised a a schedule for us, and we visited 3 wineries. The were all lovely, but our absolute favourite was Reid family. The people, wines and cheeses were just awesome. Damon was an awesome host, and took photos throughout the day. We thoroughly enjoyed our trip and wouldn't hesitate to recommend Damon. Damon was an amazing tour guide. He was very professional, but kept the environment very relaxed and casual. We had a great first day with him ending it at a wine maker's home, which we would have never found on our own. We ended up very being lucky since he did not have a tour the next day and were able to book him for the next afternoon that day. He made calls the next morning and guided us to two off the beaten path wineries that ended up being some of our favorites. His knowledge of the area and tours were incomparable and we also had a really great time with him. We will book him again. "Great time under unusual circumstances"
We were out in Napa Valley for our honeymoon as the fires were first developing in the Napa/Sonoma area. Damon did a phenomenal job of keeping us in the loop of what was happening in the area. Our original hotel we had planned on staying at was deemed non-operational and Damon actually got on the phone and called around to other hotels to check on availability for us. Above and beyond what his services required but we very much appreciated the help from a local who knows the area and the wineries. We ended up still going on a winery tour with Damon that week and he called ahead to make sure places were open and had enough staff on hand to do wine tastings. We enjoy the places he took us too and the history/tour guide lesson he gave along the way as we crisscrossed the valley during the fires. All in all, it was tough being in the region during such an awful time but Damon put us at ease the entire day. Only as the day finished did we find out his house was in an evacuation area and he was living with friends and taking care of us while his house was in danger. Damon is a truly good guy and we'll definitely be back out to see him and the region soon. Damon, of Bliss Wine Tours, went above and beyond to make our experience in wine country an enjoyable one. From the actual wine tastings, to lunch and travel.. it was an afternoon of ease and comfort. He kept us on schedule (so that we didn't have to think about it) and seemed to have many connections at the wineries we visited, making the purchasing portion go smoothly. Damon was also thoughtful enough to call us after being evacuated from wildfire to check that we were safe- something that means so much to us. I absolutely recommend Damon and Bliss Wine Tours- you will not be disappointed! This was a second tour for the 4 of us visiting the area. After the wonderful Napa tour planned by Damon last year, we decided to try Sonoma this year. Damon listened to all of our requirements (one boutique winery, one with a breathtaking view, one large well-known winery, one with "something special" etc...) as well as the types of wines we like, a customized tour was put together. It was exactly what we were looking for. As in Napa, we had a private tasting in a cave (Petroni) as well as a wine/cheese pairing overlooking the vineyards at Kundre, an outdoor tasting at Chateau St Jean and lastly a wonderful, intimate Pinot tasting at La Rochelle (which, unfortunately, has been severely damaged by the fires). This year Ryan drove us and was just as knowledgeable and entertaining as Damon, peppering us with fun facts along the way. Would recommend to anyone looking for a personalized experience. We look forward to doing this again next year! Thanks for everything Damon and Ryan! This is my second time with Damon as our driver. He selects great wineries and is fun to tour with. He made sure we got great, food, great wine and it was an overall amazing experience! I will definitely be contacting Damon again for future visits to Napa/Sonoma. Damon surpassed our high expectations for our wine tour. We had contacted three of the highly rated tour services in the Napa / Sonoma area. From the start, Damon distinguished himself from the others by discussing our interests and preferences before asking for a commitment. We told him about the kinds of wines and price ranges we wanted to explore. He provided us with the names of six wineries, from which we selected three for our tour. Damon made reservations for us at our chosen sites, but also went further. He informed the wineries’ representatives of our interests and arranged to have tasting menus tailored to the varietals we preferred. This level of individualization exceeded our expectations. During our tour, Damon was friendly and knowledgeable about the Napa / Sonoma regions and wines. Finally, with all of the unique tailoring of our tour, Damon’s fee still was comparable to the other two more generic tours we reviewed. We recommend Bliss Wine Tours in the strongest possible terms. My friends and I had an incredible trip this past weekend with Bliss Wine Tours! With our limited knowledge of the area, Damon had wonderful suggestions of off-the-beaten path wineries and was super knowledgeable of the local area. He made us feel comfortable with his easy going personality and driving. This will not the last time we book with Damon and we look forward to the next trip! Damon planned and arranged our visit to three wineries and made reservations for lunch. He picked us up at our house as scheduled and kept us on schedule the remainder of the day in order to keep our appointment times. Damon is a very knowledgeable and pleasant guide. He makes you feel relaxed right away. The choice to leave all of the decisions up to him regarding which wineries to visit was the correct one; all of them were excellent. Each location was unique and somewhere we would not have known about had he not introduced us to them. We will contact him again to set up more visits on our next trip to Napa/Sonoma. Damon from Bliss Wine Tours was great and planned an amazing afternoon for me, my sister and her husband. We wanted a more private tour, and Damon delivered. He was amazing throughout the whole process. All the places was according to our list, and you can tell that he really listens to your request. We will definitely recommend Damon and Bliss Wine Tours. "A Friendly Face & Expert Knowledge in Napa!" We have twice had an opportunity to be hosted by Damon and Bliss Wine Tours in Napa. On both occasions Damon has been outstanding. We have been treated to a flawless itinerary, fantastic wines, a packed, but leisurely day, and, most importantly, a friendly, knowledgable guide. You will not be disappointed in Damon and Bliss Wine Tours! Damon was absolutely first rate and provided incredible service. He recommended and made arrangements for fantastic (some very private and hard to get into) wineries. He kept us on schedule and moving (hard to herd cats of 5 couple drinking wine...) and he even picked up and set out gourmet lunch for us at one of our stops. I've done a couple of these tours and Damon stands above the rest. I will definitely use him again!! "What a wonderful tour of Sonoma!" Damon helped us plan and execute truly one of the best travel days I've ever had. The winery recommendations and reservations were spot on, and he helped us with suggestions for the remaining days of our trip. I'll be passing on his information to all my friends, and hope to be back soon for another tour of duty. Damon makes touring Napa easy so that you can focus on having a wonderful experience. Very knowledgeable about the wineries and valley, extremely personable, safe and punctual (everything you need in a car service). Damon took care of booking all of our reservations for 3 days of touring, served as our group (4 of us, including our son and his new fiancee) photographer and managed our time, including lunch arrangements, to enable us to enjoy the entire trip. He even helped our son coordinate timing and location for his engagement proposal (too bad the weather didn't cooperate). This was our second trip using Damon and we wouldn't think of using another service. We have used the "big guys" (won't mention by name) on 3 previous trips (each 3 days), but always had a different driver with mixed results. With Damon and Bliss Wine Tours, you'll know who is going to drive you and you feel as though you are touring with a friend. "Great experience for all ages!" Our group comprised of grandparents, parents and tweens, and Damon managed to pull off a fabulous day for us all! The schedule he put together for us was sensitive to all of our needs (limited walking, engaging for the kids), and he quickly adapted the itinerary when our timing changed during the day. We loved the wineries he suggested, and also his company during our traveling time. One of the highlights of our California road trip! Outstanding day spent with Bliss Wine Tours. Our Driver Damon was excellent in helping us select the wineries that matched our tastes, arranging for private tastings, and enlightening us on the business of wine. Couldn't have been better. trip extremely easy to plan. Had a chance to visit some smaller more intimate vineyards off the beaten path which made for a special trip. Damon seems to know everyone and was able to set up some very special surprises for us. Will definitely be using this company again! We had a great time in Napa thanks to Damon at Bliss Wine Tours. Damon has a great knowledge about wine and the area of Napa and Sonoma . He is very easy to work with goes out of his way to make sure you have every little thing. We will definitely use Bliss Wine Tours the next time we travel to Napa. My husband and I spent a few days in Napa/Sonoma for my 35th birthday and we were referred to Damon by a friend of ours. Damon was amazing throughout the whole process! He asked what kind of wine we liked and planned the most perfect two days of wine tastings. We loved every winery, tasting room and lunch spot he selected for us! He was so professional and fun!! His car was clean, he had water for us and even umbrellas (we had one day that was a little rainy). One of my favorite parts was that Damon took pictures throughout the day and sent them all to us. We are terrible about taking pictures, so it was awesome that he took them and helped document our fun days!! I would HIGHLY recommend Damon! We will definitely use Damon for our next trip!! Thank you again for an amazing time!! Damon and Gary were incredible! They were not only knowledgeable, but also professional and FUN! The wineries they recommended were fantastic, while also working in the places we wanted to see. Couldn't have asked for more! "Another great tour with Damon"
My husband and I had an amazing wine tour with Damon! We used him a few years ago when we were on our honeymoon and when we decided to come back for another trip I immediately looked him up again. Damon has great knowledge of the area, wineries, terroir, restaurants, hotels you name it. I sent Damon a list of wineries we wanted to visit and he made all the arrangements. We ended up having time for one more in the schedule and Damon selected a winery for us which was a really awesome place. Damon is super professional and makes you feel very comfortable as soon as you step into his vehicle. It was in the forecast to rain the day of our wine tour and Damon was fully prepared with ample umbrellas (details!!). He came into each winery with us to ensure we were greeted etc. and he also took pictures throughout the day. Damon was also very flexible when we asked him to drop us off in a different location then we originally planned. Can't say enough great things, we will definitely use him again next time we are in the area! "Bliss Wine Tours is the BEST"
We spent two days escorted to the sites of Napa Valley by Bliss Wine Tours. If there is a rating above excellent, Bliss deserves that accolade. Every detail was handled for us including lunch in the park complete with placemats and matching plates. Our driver, Damon, was extremely knowledgeable, agreeable, and prompt. It was apparent that he intended to make our trip perfect in every way. This is a very reliable and customer oriented company. "Damon made this an easy trip!" Damon was fantastic. We really enjoyed our two days with him, he took us everywhere we wanted to go and found a couple of extras that were on our way and enjoyable additions. He had great knowledge of the area and a good relationship with the staff at the wineries. Also, he not only picked up our lunch for us, but also came prepared with picnic essentials, from place mats to real plates! Can't wait to do it again! "This made our napa experience!" 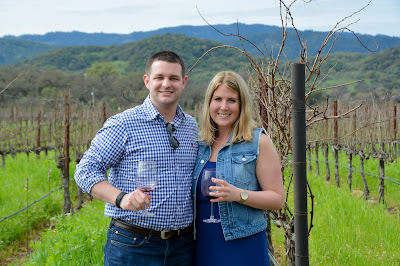 We were booked with Bliss Wine Tours through a travel agent and our experience made our Napa trip. Damon was super friendly and informative about all things Napa. He booked all our wine tours and made sure we got the most out of our experience. I would recommend him to anyone visiting, we will be sure to use him again in the future. My family and I went on our very first multi wine tour ever this past week and luckily we had Damon as our guide! He ran our tour flawlessly, which says a lot about him because our family isn't necessary known for being timely. We had plenty of time at each stop, with occasional reminders from Damon that it was time to move on to the next fabulous place. Damon provided snacks and water for in between stops, which was much appreciated. He was = incredibly knowledgeable regarding the wineries and surrounding areas. Not only did he spend the entire day with us, he made sure we didn't have to worry about anything. When we mentioned that my sisters needed to catch a bus to the airport the next day, he went out of his way to find a reputable business. He gave us great food recommendations and even called and set up our dinner reservations while we were drinking wine. The tour was laid back, perfectly planned and really fun. Mahalo Damon! Our trip to Napa Valley was a first time experience for all 4 of us. Damon made reservations and scheduled our itinerary flawlessly. At such a busy time in Napa, he still managed to piece everything together perfectly. He even was our professional photographer that took pictures that will last a lifetime. We will highly recommend Damon to all family and friends visiting the area. We will (without a doubt) continue to book Bliss Wine Tours for our new Labor Day tradition visiting Napa Valley! Damon was amazing!! A couple of days before he sent us our itinerary. He picked us up from where we were staying in SF and off we went for my first time touring Napa. What a wonderful day it was. He had refreshments in the car, very friendly and informative. We truly enjoyed that he took us to boutique smaller wineries with breathtaking views. Very peaceful. Enjoyed every moment. I will most certainly use Damon on another Napa valley tour. We booked Damon from the UK and we are so glad we did. Damon was informative, great company and made our trip around Napa relaxed and thoroughly enjoyable. He provided snacks, lots of water (after 4 visits to vineyards it was needed) . We stopped for lunch, throughout the day we really weren't rushed and just had the best day ! Thanks Damon and we will definitely recommend you to friends should they be fortunate enough to come to Napa. "Excellent curated tour of Napa Valley"
Damon was an excellent guide and made a perfect itinerary for our trip to Napa Valley. He picked us up in San Francisco right on schedule and was an enjoyable addition to our group. You will not be disappointed choosing Bliss Wine Tours. Highly recommended! "Great way to see Napa with a most gracious host"
Booking a tour can be daunting, there are so many big companies offering cookie cutter tours and dropping you off and just waiting for your return. This single person company breaks the mold. Damon was interactive, interested in us as a couple and def gave honest input on places we thought we wanted to visit. There is so much more to Napa and Sonoma than you could possibly imagine. Smaller welcoming wineries where there is no deep lineup at the bar, great dining from sandwiches in an amazing deli tucked in the hillsides to local places that you would never find just driving about. And you can imbibe to your hearts content and just watch the landscape roll by without worrying about your alcohol levels and where to make the next turn. Don't fall into the tourist trap of wine tasting. Do it right and leave feeling like you experienced everything. 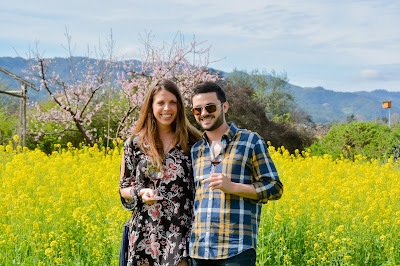 "Perfect Day with Bliss Wine Tours"
Bliss Wine Tours set up the perfect day for my wife and I to enjoy Sonoma. I gave Damon the reigns to book our tours and lunch and he coordinated the entire day. All I had to so was let him know where to pick us up and generally what type of wineries we preferred. Damon came through with the perfect day and even managed and course corrected whenever we stayed too long at one place. Bliss Tours is fun and friendly with full professional service. You will be happy with your choice. Beautiful and an unforgettable experience. Very intimate and family driven vineyards that are very unique and also very personal. Loved it and will do it again! "The only way to do Napa"
One of my college best friends and I spent the weekend in Napa August 10-12. I heard about Damon through a coworker, and it was easily the best decision we made for our trip, aside from going to Napa in the first place. Before the trip, Damon called and asked about our preferences - what kind of wines we liked, what kind of experience we were looking for, etc. and accommodated EVERYTHING, and more once we got there. He was extremely professional and knows the area so well - one of our original tastings was a 'first come first serve' type winery, and while we were sipping wine at another tasting, he had called to check to see how crowded it was, found out it was packed, and booked us to another winery without us having to worry about anything. Also, he is a lot more reasonably priced for a driver in Napa, especially for a smaller group, than pretty much every other driver service you'll find. If you're going to Napa, you NEED to book Damon, you won't regret it! Our Napa experience with Bliss wine tours was exceptional. Damon was very knowledgeable and helpful throughout the whole process. It was our first trip to Napa so he helped coordinate all our tours/tastings. Not only did he suggest great wineries for us to try based on our preferences, but he also scheduled and timed everything for us perfectly. When we spent extra time at one winery, Damon was kind enough to go grab out lunch for us (amazing sandwiches from Yountville!). In the car he had water and snacks, including some delicious local melon for us to try. During the tour he even took group photos for us. I would highly recommend Bliss wine tours to anyone traveling to the Napa area! Damon organized a wonderful tour for my husband's and my first trip to Napa. Gary was our tour guide for the day and he was great. He was extremely knowledgeable. He took us to Frog's Leap, The Terraces, Goosecross and Domaine Carneros. We ate delicious sandwiches from Sunshine Foods at the Terraces and the view from our picnic table was beautiful. We will be booking with Bliss Wine Tours the next time we are in Napa. "Napa Valley - Two Great Tasting Tours"
We traveled to Napa on a family vacation. A friend recommended hiring Damon of Bliss Wine Tours to be our driver so all four of us could partake in the tastings. Damon recommended a great mix of vineyards from large commercial vineyards like Robert Mondavi to a smaller private tasting at Jericho Canyon. Damon had great lunch recommendation and coordinated the timing perfectly throughout the day. We were so pleased we asked him to provide us a second tour day and it was just as enjoyable. Make this the focal point of your Napa vacation! 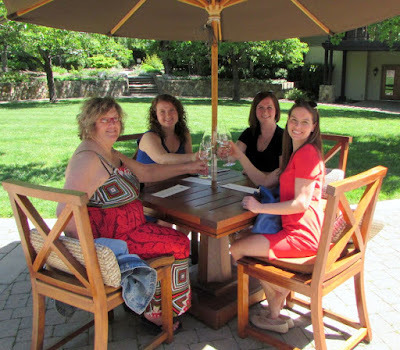 "Bliss Wine Tours made our Napa trip incredible!" I can't say enough good things about Bliss Wine Tours and Damon! 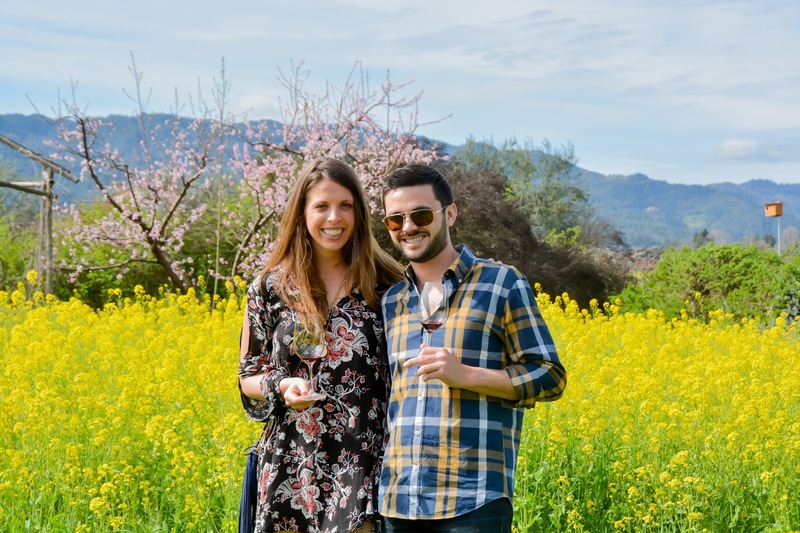 From planning out the perfect itinerary, taking the best pictures and providing the best information on all things Napa, you absolutely can't go wrong with Bliss Wine Tours. We heard about Damon through a friend and we couldn't have been happier with this decision. Damon is so personable, knowledgeable and detail-oriented -- he made our experience one of a kind!! "You Can't go wrong with Bliss Wine Tours"
Damon was amazing! He thinks of all those things you don't want to while wine tasting. We had a group of 8 and each one of us left happy. He knows all of the best spots to give you the true Napa experience! "Bliss Wine Tours is Heavenly"
We have toured Napa twice with Damon. He is knowledgeable, personable, and a great resource. Will custom fit a tour made for you. Great whether you have never been or are and old veteran. Knows a lot of great wineries of the beaten path producing some spectacular product. Book with him and you'll never go wrong. "You Can't Miss when you Book Bliss!" Go ahead and book your Sonoma or Napa Wine Tour with Damon before he gets booked up. He was so professional and easy to work with. He customized a personal itinerary for us and didn't mind changing it up a bit when I had more suggestions from a friend. He picked us up from our airbnb in San Francisco, made all of the appointments for us and kept us on schedule so that we could see a diverse group of wineries. He was easy-going and educated us about wines and the area. He planned a picturesque picnic for us on a mountaintop and picked up delicious deli sandwiches. He also took photos of us at each winery and e-mailed them to us. It was a stress-free way to do wine tastings because Damon took care of all of the arrangements. It was a 9-hour tour and the day was a total success. I highly recommend Damon because he is super knowledgeable about Napa and Sonoma and is like touring around with your best friend. "A Great Sonoma Day Tour!" Damon planned an amazing full-day Sonoma tour including where we visited four small wineries in Russian River Valley and Dry Creek, which we would have never known of without the tour. My wife and I had both been to Napa before, so we decided on Sonoma this time and stayed at a B&B in Healdsburg, which is a wonderful town and home to the famous Simi winery. Damon also gave us some great tips on some tasting rooms in town and restaurants in the area for the other days on our trip. I should note that our visit was actually right before New Year of 2015 but whenever we open a bottle from this trip, we still talk about what a great time we had on Damon's tour. 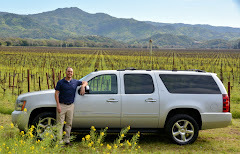 "Best way to see the Napa Valley"
Damon takes great pleasure in setting up an amazing itinerary focused on our tastes. We spent 2 days with Bliss touring small wineries and learning the fundamentals of great wine! All 6 wineries we visited offered great views of Napa and offered a 1 on 1 experience with owners and wine tasting experts. I would highly recommend Damon to both newcomers and Napa Valley Experts. We will book our next trip with Bliss!! Damon did an amazing job showing us all things Napa. He took the time to get to know us and quickly customized our experience to suit our interests. My wife and I had spent two days in Napa prior to taking a tour with Damon, and we were astonished at all that we'd missed without him! Whether new or experienced to Napa touring, Damon has a unique ability to make sure your time in Napa is unforgettably enjoyable. We can't wait to go back! Great experience with Damon! He was friendly and knowledgeable and took some great pics that he shared with us! He had a very comfortable car that he kept stocked with water and snacks for us. Even though we had some unpleasant weather, Damon greeted us on time and with an umbrella for everyone in our party. We were very comfortable in his new and spacious suburban and were pleasantly surprised with plenty of snacks and water for all of us. He has great knowledge of the history and process of winemaking and taught us a few things at each of the 5 wineries that we visited. We were there for my sister's bachelorette party so things may have gotten a little rowdy, but Damon didn't judge and laughed right along with us. Best part is that he even took pictures throughout the whole tour with his own camera so that we could always look back and remember our amazing day! We can't wait to go back and wouldn't even consider hiring anyone else! "Great Times - Very Reasonable Price"
My wife and I came to Napa for her 30th birthday. The weather was pretty awful but Damon with Bliss Wine Tours was incredible to detail with. He greeted us with umbrellas at the beginning and end of each tour we went on and was incredibly knowledgeable about the area and wineries. I will 100% be using this company again. Damon was the perfect driver on our first trip to Napa! He was friendly, knowledgeable and so great to talk to in between wineries. He made our trip so special and will recommend him to everyone! Thank you, Damon. We had an amazing day with Damon. He coordinated our entire tour which included four vineyards and lunch. In addition, he provided snacks, water, and photography. It was such an enjoyable and easy going experience. I highly recommend Bliss Wine Tours and Damon! We cannot wait for our next trip to Napa. Thank you again Damon for such a great time! "Thank you Damon and Bliss Wine Tours!" We had a 2-day wine tour and we were so pleased with Bliss Wine Tours. Everything was easy and each winery Damon selected and reserved offered us a little something different. Soon after our trip, Damon emailed us lots of pics from our two days which was a huge bonus! I highly recommend Damon and his Co. and hope to join them for another tour soon. If you want to experience a perfect day in the Napa Valley, you need Bliss Wine Tours. Damon planned a perfect day of wine tasting for a big group of friends who were visiting from out of town - and we are so grateful! We asked for a winery with games, he brought us to a winery with games. We asked for pretty views, he brought us to places with the most spectacular views. It was nothing short of perfection - and he even took photos of us along the way so we'll have memories forever. He was extremely communicative before we even left for Napa and once we were there he was punctual, professional and fun!!! Thank you Damon!!!! We will be back!!! "Best Weekend of Our lives - Bliss Wine Tours contributed to that!" Where to start? We were a group of loud, energetic, and sassy LA & New Yorkers... and eager to drink all the vino Napa had to offer. Damon and his services were phenomenal. He picked us up promptly and had the day planned out. He often had to wrangle us all as the day progressed (wine on wine on wine) and he did so with ease and patience. Every time we jumped back into the car, there were fresh bottles of water and snacks waiting to soak up the alcohol. He was personable, knowledgable, and downright awesome. "Amazing Day - exceeded all expectations!" I found Damon and Bliss Wine Tours through TripAdvisor. We visited Napa for one day with another couple, and none of us had been to the area before. Damon planned our entire day, choosing three wineries and making the reservations, and also picking a spot for lunch. We loved every minute of it! Damon's rate for driving to Oakland to pick us up and drop us back off was very reasonable. He was very knowledgeable about the area, and we left knowing a lot more about wine than when we started. The pictures that he took of our group were a huge bonus and turned out great! When we make a trip back to Napa in the future, we will not hesitate to book another tour with Damon. It was an amazing day! "AMAZING Experience & Fantastic Customer Service"
We visited Napa Valley in late January with 3 couples. Gary was our driver and he was very knowledgeable, thoughtful and fun! He had water and snacks for the ride, and the even brought us lunch at one of the wineries. Prior to the trip he made recommendations and kept in touch to make sure we were setup and ready to go by the time we arrived. He was very professional and catered to our needs. He even adjusted our schedules to accommodate the fact that we spent more time than anticipated at one of the wineries. After the trip, he sent us BEAUTIFUL pictures of our travels!!!!!! Such a nice addition, and wonderful memories. I would HIGHLY recommend Bliss Wine Tours, and we will certainly use them when we go back to Napa. "Impeccable knowledge and customer service in wine country"
I was referred to Damon by a mutual friend at Redmon wines (a must stop if you're in the area) and was not disappointed! He offers personalized service and I highly recommend him! He set up a memorable day for me and my friends who were visiting from the east coast for the 1st time. During the planning process with me he was prompt in email communications and made valuable recommendations when my first choices weren't available. He set us up with a full day that includes a variety of vineyards from larger run companies and tours to small boutique wineries. I will absolutely recommend and tell all my friends about Damon and book him as soon as you know you're going because he will book up! Damon, of Bliss Wine Tours, is the best driver in the valley. Extremely knowledgeable, cute, and well connected. If you're visiting the Napa/Sonoma area, call him for an amazing tour! "Napa Fab Four Trip of a Lifetime!" This is the ultimate way to experience Napa!! Damon was amazing. He knew so many things about the city, the wineries we visited and so much more. He made us feel like family the second we met him. This was our first trip to California and Napa! Four best friends and a 5 star guide made this the trip of lifetime. We only had 2 wineries we wanted to see and let Damon pick the rest. We were never disappointed and never empty handed leaving. I can not express how much he had to do with making this whole trip unforgettable. We are already discussing next year's trip and the one thing we do know, Damon and Bliss Wine Tours is who we will be contacting every time we visit. Thank you so much for being AMAZING! This is the very best way to experience Napa. Damon was the perfect host. He coordinated two days of wine tastings and tours based on our preferences (we were looking for smaller, family owned wineries) and then he carried out an amazing, flawless experience for six loud ladies. What I really think sets him apart from other tours is small details that he never forgot: he always had his vehicle stocked with cold water and snacks, he took care of ordering and picking up our lunches each day, found amazing scenic spots for us to stop to eat, and he even brought his own camera to take photos for us!! I've never experienced a tour even close to his. And of course, he knows his wine. I highly, highly recommend. Two couples become empty nesters. What better place to celebrate than Napa. Bliss Wine Tours was the perfect experience for a day in the vineyards for the four of us from Minnesota. Damon greeted us in our hotel in Napa with all of the knowledge of the world famous wine country and a great ride without a worry about where to go and when to get there. We began our day at 9:30 am and toured 4 vineyards throughout the day. We had one of the most spectacular lunches in my lifetime and invited Damon, our driver, to join us for more insights into this region full of history, science and gastronomy. Our day ended at 4pm back at our hotel. The trunk was full of the treasures found on our journey. I very strongly recommend Damon and Bliss Wine Tours for your next stay in Napa. His services are affordable and well worth a luxurious tour of one of the most beautiful regions in all of the USA. Why drive yourself when you can have a worry free day with the region's best!! Bliss Wine Tours is your ticket to a fun day in the vineyards. I'm jealous! We had a wonderful day in Napa Valley -- all thanks to Damon. He listened to what we wanted and delivered an amazing experience. All the boutique wineries were booked in advance. We had a private tour at each of four very different, welcoming places. We never felt rushed. He had plenty of water for us in the vehicle and even picked up our lunch and delivered it to us to enjoy at a beautiful outdoor setting. He took photos so we didn't have to think about that either. Loved, loved, loved everything! "Excellent! Definitely book this tour"
What a wonderful and relaxing way to tour Napa! Damon customized our tour to what we were looking for and arranged everything for us ahead of time. He was so knowledgeable, personable, and accommodating and took pictures for us as well so we didn't have to do anything but enjoy ourselves. Conversation never lagged and Damon often had interesting tidbits to add about the wineries, the area, and where we might want to visit next time we are in Napa. It was pretty clear the wineries in the area thought highly of him as well as we were always greeted so warmly upon arrival and treated so well. I would definitely tour with Damon again! "The only way to tour Napa Valley!" This is best way to experience the Napa/Sonoma Valley! There were 6 of us on a girls trip and Damon organized the perfect 2 day wine tour for us! He customized the wineries we visited to our requests (smaller, family-owned wineries that we had not visited before), was very knowledgable about wine and the valley's history. He had a great relationship with the wineries and it made our experience personal and enjoyable. He brought his own camera and took great photos for us during our trip; it was a treat to have him be our photographer and take candid photos of our experience. He arranged for picnic lunches with beautiful views and delicious food from local eateries. We visited some great wineries, found some new favorites, and had a blast the whole time. If you're looking for a Valley tour with a fun tour guide, visiting some beautiful wineries and having a great time, you definitely need to book with Damon! Absolutely loved Damon! We have been on tours previously in Sonoma/Napa and this was one of the most fun. He is very knowledgeable, personable and made the trip all about us. Strongly recommend Bliss Wine Tours! "Returning clients for over 5 years!" Damon is without a doubt one of the best-liked and most knowledgeable tour operators around. I know this because we have gone back to him several times for day tours. You can also figure this out when you observe all of the vineyard's reception of him. He chooses vineyards to your specifications, plans a beautiful itinerary with great food, and adds special touches like homemade cookies -With both small and large groups. Damon is also well-traveled, a skilled photographer and pastry chef. Soo- I can only hope that he will continue to take our reservations in the future as I know he will be in high demand. Cheers. We were in the Napa area for a long weekend, and used Damon on two separate occasions during our trip. We spent a day wine tasting, and had only one winery we knew we wanted to visit, and based on our preferences on wine, he recommended others to visit, and made the arrangements for us. It was great! We also used him for a special dinner we had planned, and he made everything easy. He also sent us photos he took of our festivities, which we will treasure. I would definitely recommend him for any wine country activities you might have. Was in Napa for a four day trip (actually one day in Sonoma). Damon took us around all four days - Excellent knowledge of the area, including wine, wineries, personalities, restaurants, dive bars (Pancha's). Always early and even helped us out with some additional transportation needs after our tours were over. Cannot imagine a better person to take us around Napa. There is a reason he has 100% positive feedback!!! Damon was the absolute best. 2.) Kept us hydrated between stops. 3.) Picked a variety of different smaller wineries for us to tour. Each one was much different than the others, which was awesome. 4.) He was very knowledgeable about the area and even laughed at our stupid jokes. 5.) He took some excellent pictures that he shared with us after the trip. All around A+ experience. Highly recommend Damon. This is our second time using Damon as our guide for a girls’ weekend getaway. We were so impressed with his professionalism, friendliness, humor and knowledge of the area/wine, we knew we had to use him again for our return trip this past July! Damon does an excellent job selecting the wineries and customizing trips to his clients’ tastes. In addition to that and most importantly, Damon knows exactly when to join the group to provide history about the winery, specific type of grape/wine, answer questions etc. but then he also knows when to let his clients sit back, relax, and enjoy themselves. By the end of our trip, we considered Damon our friend not just our guide. Damon also takes photographs during the winery tours which is great because we wouldn’t have been able to get candid group shots at each winery with the beautiful Napa scenery behind us. Thanks Damon! Your friends in Chicago hope to be back soon! Damon is incredible - an absolute delight who knows so much about the entire region. Our party of 6 spend the weekend with him and every detail was perfect - took all the stress out of the weekend allowing us to enjoy the tastings. Even little detail like have Gott's and Freemont Diner menus in the car. Couldn't recommend him enough and can't wait for my next trip to Napa with him! "Damon is the absolute best!!" Just returned home from visiting Napa for the first time and Damon was our tour guide for 2 terrific days through Napa and Sonoma. I can't say enough great things about Damon. He totally set us (6 ladies ranging from Florida, Kentucky, NYC, Upper Michigan and Ohio) at ease immediately with his professional, easy going, smart , funny demeanor. Since this was my first trip to Napa, I so appreciate the wealth of knowledge Damon provided about vineyards, wine making, geography, cuisine and so much more! Make sure you seek out Damon for your guide as you will not be disappointed!! Thank you Damon for making our trip great !!! "Damon and Bliss Wine Tours = Wine Country Perfection"
I just came off of my third trip where I had Damon as my driver. I've gone on other trips prior to meeting Damon, and they pale in comparison. In addition to being well-rounded and personable, Damon is super knowledgable of all the appellations in the region and can build a custom itinerary that will meet your wildest expectations as well as please a "mixed bag" of wine enthusiasts and palates. If you're a foodie, he can help you there, too. Damon is my "go to" when I head to wine country and is the first recommendation I make when someone asks me what to do and see when heading that way. Do yourself a favor, before making any plans, book Damon on your next trip and let him work his magic. He can help you plan the perfect wine country vacation for any occasion from start to finish. Oh, and he photographs the highlights of the trip for you, so no need to carry around that annoying selfie stick (unless you want it)! My husband and I did two days of wine touring with Damon on our honeymoon. One day was spent in Napa and the other day in Sonima. Damon emailed beforehand to ask our wine preferences and any wineries we had in mind. We didn't and left all of the planning up to Damkn. He did an amazing job and chose awesome boutique style wineries. He even had amazing lunch recommendations for us. Damon is a wonderful guide and we will definitely book him next time we are in Napa! We spent 2 awesome days in Napa with Damon. We were fortunate to be introduced to him by a friend. He played a big part in planning our itinerary ultimately, tailored to what we were hoping to get out of the experience. Damon was very knowledgeable of the local wines and more importantly of the people behind the wine. We took pretty quickly to Damon - he has the temperament for any group. And he's got a bit of a fatherly side to him as it was imperative that we were well fed and well hydrated in order to survive the tastings. He took some great pictures for us to capture our experience too. I would strongly recommend Damon for anyone making a trip to Napa - he's the way to go. Damon is the MAN. He is very knowledgeable about the NAPA/Sonoma area (history, grapes, things to do, places to eat) and what vineyards to visit. He customizes the trip according to your tastes (particular style of wine, small or large vineyards, etc) and makes sure that the schedule stays on course. His knowledge of wine was impressive and he was able to add onto the things we learned at the tasting. He is very friendly and we quickly considered him more of a friend than a "guide". To help memoralize the trip, he takes a ton of pics, organizes them and then sends. He really made the trip smooth and seamless which just added to our overall experience. We will definitely recommend using BWT and we plan on on calling our friend Damon the next time we visit wine country. We come out to Napa every year and enjoy going to different vineyards with a driver. Our previous driver moved away so he highly recommended Damon and said we would be in great hands. Boy was that an understatement! Damon absolutely made our trip the best wine tour we have had in Napa! From the on time arrival each day, to the cold waters, to the picture taking during tastings and his direction around the valley we could not have been more pleased. He is professional and approachable. YOU MUST book Damon for your next wine tour, no question about it. He is worth every single penny and you will enjoy your day 1000% times more knowing that you are in good/safe hands as you enjoy all that Napa has to offer! Damon was so much fun. We were celebrating my 40th birthday and he is so fair and a genuine good guy. Our group loved him and would definitely recommend him. We hope to see him again! Damon was an excellent guide! We were able to see some lovely wineries and met with the owners, which was a special treat. He also took pictures and sent them to us. He was flexible when our travel was delayed, and went to extra effort to rearrange for us. I'll definitely tour with him again when we are in the area! We planned our first trip to Napa with another couple and we arranged for Damon to coordinate our first day. From the moment he picked us up to our farewell at the end of the day, Damon's service was absolutely fantastic. His attention to detail was remarkable. We will definitely hire Damon on our next trip to Napa. If you are looking for best guide & driver in Napa, Damon is your guy! From setting up the perfect tastings based on our preferences, to snapping amazing pictures all throughout our tour, to his extensive knowledge of the area, the vineyards, wine-making, grapes, and everything in between, Damon was absolutely perfect. From the first time I spoke with Damon on the phone, I knew he was committed to making sure we had the absolutely best trip possible, and that's exactly what he did.We had such an amazing time that we are already talking about going back! If you want to get the most out of your Napa experience, do yourself a favor and book Damon - you won't regret it! Had a great weekend zipping around Alexander Valley with Damon! Not only was he knowledgeable he became our personal paparazzi! Certainly would hire him again when in need of a driver in wine country! "The greatest tour of Napa with the best guide!" Damon was such a nice guy with extensive knowledge of the valley, the wineries, the vintners, and the grapes. With a large group, he kept us moving when needed and knew when we needed a little bit more time at certain stops. I will absolutely give Damon a call each time we come to the area! "Bliss Wine Tours is top notch!" My girlfriend and I visited Napa and used Bliss Wine Tours. Damon is punctual, flexible, easy going and incredibly knowledgable about wine and Napa vineyards and restaurants. We would highly recommend Damon and Bliss. "Private Wine Tour at its Best!" If you read my past reviews of wine tours, you'd see that we used a few companies that we really liked. The last we used, however, was less than stellar and since then we've been hesitant on using/trying another one. We have tried semi-private and group tours and all have been wonderful, but during our last trip to Napa, we decided to go private. My husband and I couldn't be any happier! Damon was able to take us on yet another tour - customized to our liking, of course! We visited one of our "musts" in Napa and as usual, Damon had great recommendations as well - and not just of wineries, but restaurants and local spots to boot. I can't say enough great things about Bliss that hasn't already been said. All I know is that we will definitely visit Napa on the regular, and Bliss is the only company we will ever use! We were visiting Napa for the first time for 2 days. We had a tour scheduled for the first day and loved it so much we wanted another one. Damon magically pulled together an amazing tour at the last minute. Each winery was fantastic in it's own way. He arranged lunch at Gott's ahead of time so we didn't need to wait. And the photos he took…..amazing!! Not only of us, but he sent us some really great scenic pictures that we would have never taken - he has a fantastic eye. The day was wonderful and the photos will preserve that day. Thank you Damon for a wonderful experience (especially at the last minute!)!! Damon was pretty awesome! No exaggeration. I called him, told him what I needed, asked for him to add additional recommendations and provide a rate by end of day. I was much nicer with these demands than it sounds, but nevertheless, Damon was on it! It's refreshing to come across someone who takes time into the services they provide. Damon hit the mark. engaging, great to chat with in the car and he even took photos to help us capture the day. We really appreciated his efforts and even became members at Madrigral Family Winery, his recommendation. We had a great time and I'd recommend him to anyone. Thanks Damon! "First Time in Wine Country"
What an incredible trip. Have been waiting to visit for 15 years, expectations exceeded. Damon's guidance and knowledge definitely played a huge role in creating a wonderful experience. Damon made our trip to Napa a pure delight. What impressed me most was the personal service. He created an itinerary for our day based on our likes and dislikes - and our tour could not have been more perfect. He did all the leg work for us so all we had to do was sit back and enjoy the day!! Bliss Wine Tours is such a great concept for a truly intimate Napa experience, and the cost is extremely reasonable for what you get. I strongly recommend Damon and his company -- simply superb! "Another 'Bliss'ful trip to the wine country!" This is the second time that we have used Damon as our driver for wine tastings in Napa. He has excellent knowledge of wine country and worked very diligently with my husband prior to our trip to set up our two days days of tastings with him. We were very excited to discover on our recent visit that he has now added photography as part of his tours! He took some wonderful posed shots as well as candids that we would not otherwise have had...very special. No selfies necessary! We love our trips to Napa and now Damon is a must for when we go back! Damon was so knowledgeable about all the different wineries Napa has to offer. From the first interaction with Damon he was extremely professional and thoughtful about how to plan out our day. Before scheduling all of the appointments, Damon and I chatted about the types of wineries (big and commercial, small and family run, etc) and the type of wine we prefer and then he provided a list of many wineries he would suggest. Every single winery we visited was such a unique experience! Damon took care of booking all of our appointments and the day went terrific. He was very personable and shared a lot of background on Napa and the various wineries we visited. He even made us dinner reservations while we were tasting! I highly recommend him without hesitation! We had a great day wine tasting with Damon! He has a ton of knowledge about the growing and wine making process, so I was constantly asking him questions. We fit in four tasting at incredible wineries. He also took our photos all day which was such a nice addition. Highly recommend!!! "Damon is a Must for Your Next Tour"
We have been to Napa numerous times and used Damon for the first time on our last trip. His service was great he took us to some new family wineries which we really enjoyed. If you are looking for a more boutique experience tasting with the owners and wine makers Damon is your man. He will definitely be driving us in the future. "Fantastic Wine Tour with Damon!" We did a couples trip to Napa, and Damon made our experience so memorable and unique. Our favorite wineries were family wineries that we would have never found or had access to on our own. We were looking for a care free vacation, and Damon made it exactly that! He planned our days out for us with wonderful wine and food and took great photos of our time in Napa. I am telling any and all of my friends heading to Napa that they MUST use Damon and his services. He really allowed us to have a relaxing vacation! "Wonderful Wine Tasting with Damon!" My wife and I were celebrating our first anniversary and we used Damon's services to show us around Napa and tour different wineries. We could not have been happier with Damon. He was extremely knowledgeable of the region, wine making, the culinary scene in general, and the specific vineyards. We ended up using his recommendations for wineries to tour and could not have been more pleased. He really helped us have a truly wonderful experience! We will definitely be hiring Damon the next time we're in Napa! We have been coming to Napa for 12 years. We met Damon approx 8 years ago, and having him as a driver each year is a must! We book airfare and hotel, and our next call is to Damon to reserve him for the day. He knows the area, knows the folks, and he is a joy to be around. "Tailored, Timely & Treasured Tour"
"The Way Wine Touring Should Be"
My husband and I have used Damon for more than one wine tour. He makes sure to tailor each adventure to our specific needs! Damon is prompt, knowledgeable, friendly, and courteous. We never feel pressured, uncomfortable, or awkward with our wine knowledge compared to his! He answers any and all questions and has an amazing wealth of knowledge about both Napa and Sonoma. We've also found several GREAT restaurants thanks to his recommendations. Donald & I cannot wait for our next wine adventure and will definitely use Damon again! We heard of bliss wine tours through word of mouth from people we met by chance in Savanah, and it was the best tip ever! Damon Mushrush is an amazing guide. He selected the vineyards based on our palate, and was extremely knowledgeable. He knows the area and the people, and when my husband wanted to saber a bottle of champaigne, (crazy) Damon was able to set this up in the middle of the tour! We had a blast, such a memorable trip! Would highly recommend this very friendly, personable guide. We had an amazing day! This was my first trip to Napa and it was an amazing adventure! We learned so much about the area. I was traveling with my parents and my mom's cousin and his wife. Our tour was perfectly catered to our group. My family is very interested in farming and Damon made sure to stop by several gardens and take us to his favorite market. Such an amazing tour. Was able to answer all of our questions and we had a lot of questions. I highly recommend Bliss Wine Tours and Damon Mushrush. Damon is a really great guy - so easy going and knowledgeable. This was our first visit to Napa, and Damon helped make it so much fun! Before we knew about Bliss Wine Tours, we had already planned and reserved our tastings and tours, and Damon was very helpful in confirming that the choices we had made were good for our group and our interests. He even added a tasting at one more winery he felt we had time for. In the future, we will let him do all the planning and scheduling fur us! We spent most of the day with him - from 9:30 to 4:30. He picked us up at our hotel in his SUV (plenty of room for 6 of us) and before our first 11:00 tour, he gave us a great tour of Napa and Napa Valley - very informative, interesting and educational. Knowing that we were interested in farming, he even took us through the vegetable garden at The French Laundry. His culinary experience is a great bonus! (He is a graduate of the Culinary Institute in St. Helena.) Our wineries: Del Dotto, Silver Oak, Frog's Leap, and Round Pond. Because he knows the area so well, we were always exactly on time for our tours/tastings at the wineries - not too early, not too late and we never felt rushed. He even called in our lunch/sandwich order at the popular and busy Oakville Grocery, so it would be ready when we arrived. Super fun day! You won't be disappointed - Damon is great!